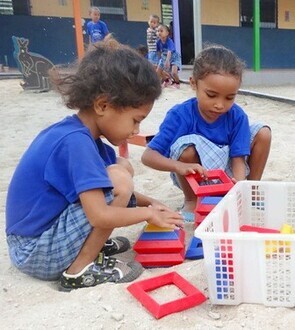 Kids Ark works with the poorer and disadvantage in the district of Hera in Timor Leste. As needs are recognised by the local community, further projects are undertaken. Wow, time flies. 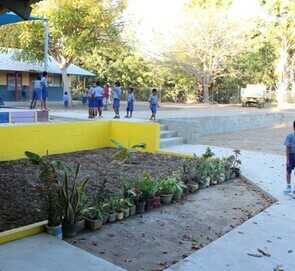 By mid 2016, 3 new classrooms and a library were complete in a new block to the rear of the school complex. The new block is joined by a covered breeze way to the existing classrooms. They were opened ready for use by some very excited Teachers and Students. The majority of work on the project was undertaken by our local work force with a few great expat volunteers coming along side to assist, maximising local content and training where ever possible. The construction phase provided steady employment and much needed income for 6 to 8 local men for the duration of works. Design by Rob White from Rob White Consulting and Construction Supervision by Bruce Barlow BLS Construction. The central grounds where levelled and a block retaining wall and access stairs put in place to divide the school site. The lower level area now serves as a general meeting and recreational area. A very big thank you to all our friends and supporters from far and near who made this all possible. 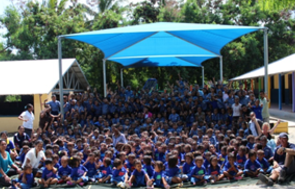 The school is an amazing focal point for the Hera Community, local children, adults and staff. The new classrooms have given a much needed boost for space to enable the school to re work the use of other classrooms, one into a dedicated Teacher / Training and Resource room. The Library is fast becoming one of the favourite rooms in the school with its beautiful soft carpeted floor. With this phase of construction finished we now need to turn to the ongoing maintenance required to keep a school of some 350 children and 22 staff operational. There are always opportunities for volunteers to become involved and help with maintenance work and general works around the school grounds. If you have ever been interested in Timor Leste and see yourself being able to lend a hand contact Bruce Barlow at brucebarlowbls@gmail.com for more information. Quality medicines and first aid supplies for the medical clinic.